In 1819 we find that six furnaces were in blast, and in that year the produce was 11,000 tons of pig- iron and 12,000 tons of bars. In 1821 Cyfarthfa turned out more pig and bar than had been produced in the whole country between 1740 and 1750, and fully half of the total yield as late as 1788. The bar iron produced by William Crawshay was in great repute, and in the countries bordering on the Mediterranean the trade was immense. One of the ironmaster’s methods was to help Turkey by taking bonds, and this gave additional impetus to trade. 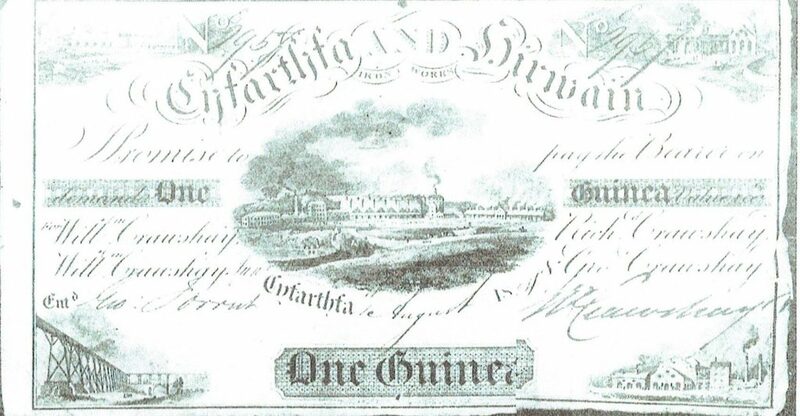 Cyfarthfa bar being so esteemed, there was some rivalry between makers, and it was found that the mark used by the Penydarren Company was so similar to that of the Cyfarthfa bar that it was imperative Mr. Crawshay should protect his rights. He accordingly brought an action against Alderman Thompson for imitating his mark, and, having gained the trial, he published the report in Russian, Turkish, and other languages. In the conduct of his legal business Mr. Meyrick was the chief lawyer, as the term was freely used in those days. Previous to the great case, Crawshay versus Thompson, being carried on, it is related that when the ironmaster first consulted Meyrick he was not at all willing to institute legal proceedings, but proposed, with the characteristic frankness and sturdy manliness for which he was famed, to have the quarrel settled in the old British way! Against this, naturally, the lawyer, with financial foresight, so protested that the ironmaster gave it up with shrugs of the shoulders and protests about the weakness of such a course. When the ironmaster was a young man an incident happened which would have enlisted the services of Sherlock Holmes. It has been stated that during Bacon’s time a murder was committed at Cyfarthfa; so also in the early days of William Crawshay, and, as this created a long enduring sensation, we cannot pass it by. We must premise by stating that William Crawshay took a higher social position than that of Bacon or Richard Crawshay. They were content to live in the dingy house opposite the works. William removed to Gwaelodygarth House, and obtained a competent architect to plan a castle, with a wide area of grounds, parks, and meadows, such as can be seen to this day. Cyfarthfa Castle was ready in twelve months, at a cost of £30,000. When installed with his gamekeepers, gardeners, and a large staff of servants, he vied then with any magnate of the land, and yet was the plain, unassuming, and energetic iron-master as his grandfather had been. One of his gamekeepers was named John Lloyd, who lived with his wife on the borders of the estate at Pontsarn, and it was a well-known fact that they did not live happily. They were not well mated. Though living in a lonely spot, some of the servants of the castle, or farm labourers, came occasionally in contact with them, and it was at length remarked that the wife was never to be seen. When questioned, John Lloyd said that she had gone away to Llangyfelach Fair; but as she did not re-appear, and as it was well-known that they had lived a quarrelsome life, the subject of the strange disappearance was mentioned to Mr. Crawshay, who made a personal inquiry. He too, was dissatisfied. John Lloyd’s face was an evil one, and his replies confused; a close search was made about the house and grounds, and, this failing, London detectives were sent for, and these made a rigid investigation. Everyone became intensely interested. The times were primitive, and though education was at a low ebb, and people resorted to their own way in settlement of disputes, there was a rough manhood to the fore which regarded evil deeds with sturdy disapproval. If John Lloyd had reason to find a fault with his wife; if he was jealous of her, there was a way to punish her and the offending man other than by sacrificing the poor thing’s life. The London detectives were looked upon with awe, as being of a different order to themselves, and they little doubted the crime would be brought home to the offender. Yet hours and days passed, weeks followed, and there was no sign. It was said that bloodhounds were to be employed, but, if so, it was kept very secret, and eventually the men went back to town; and John Lloyd remained free. The supposition was that the villain, having murdered his wife, had “boiled her down for the Cyfarthfa hounds!” and, having had several days-time before her disappearance was noticed, had been enabled to do this without detection. It would seem that preparing the food for the hounds was part of his duty, and it was noticed about the time that he was unusually careful in cleaning the furnace and vessels. This was remembered, and the detectives, who had the hint, made these a special object of search. It was only in the present generation that the murder came out. About twenty-five years ago an old man died in a poor-house in Tydfil’s Well who turned out to be the suspected murderer, and near about the same time, most singularly, a skeleton was brought to light on the borders of the Cyfarthfa grounds, which was believed to be that of the unfortunate woman. John Lloyd died, and made no sign of guilt. He died poor, diseased, and wretched; and the neighbours say that his long life was one of poverty and sickness. They assumed that he destroyed his wife. The Nemesis of incarnate justice was upon his track from the very hour he did so, and peace of mind was never his again. William Crawshay never lost an opportunity to make his works perfect; he would be second to none. Thousands of tons of puddled iron travelled down the Glamorganshire canal annually. Mills of the most elaborate character were erected, and one of these, designed by William Williams, a grandson of the former of that name, connected with No. 8 puddling furnace, was opened in 1846 amidst general rejoicings. There were eighteen balling furnaces and twenty puddling furnaces attached to this mill, and in March, 1847, these turned out no less than 6,144 tons of rails. For the railway era had dawned, and merchant bar had become secondary to the sinuous length of iron, which was to become more significant in ironmaking than any production which had preceded it. It was to be the great link of hamlets, of towns, and of cities, and still more of nations. The cannon had breathed forth its hoarse voice of war; the rail was to be the silent messenger of peace and goodwill, winding its way throughout the land, skirting seas, piercing through mountains, waking up industries in hollows which had only echoed to the voices of Nature: to those of stones; and brook; and birds, with the mowers’ rasping sound, and the reapers’ toil. Never before in human history had there been such a marvellous wonder-worker! But for the steam engine and the rail, England might have gone back to Tudor days or the contentious war of the Commonwealth. The railway was to be the precursor of a civilisation which would admit of no retrograding step. Houses of God, even if they had neither spire nor bells, were to be multiplied, schools become numerous, and in the wonderful increase of peaceful and elevating pursuits England, as the great workshop of nations, was to lead the van. 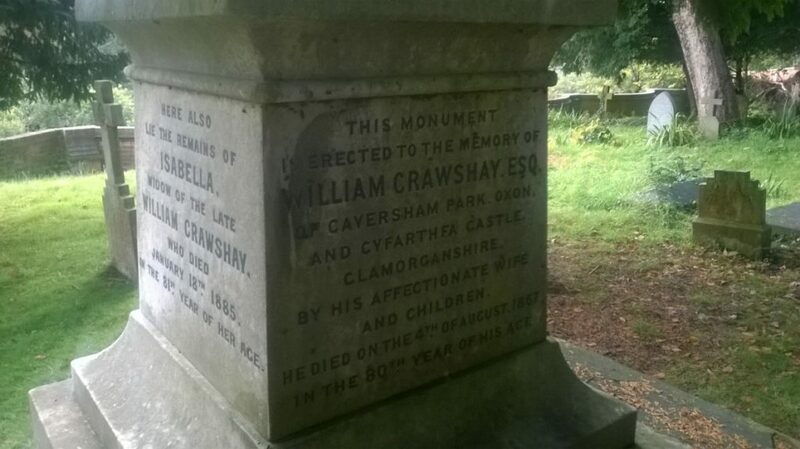 To aid this grand object, William Crawshay stood a head and shoulders above all men. As we shall show, Cyfarthfa, Dowlais, and Plymouth were the great suppliers of rails, not only for England and Wales, but, as the railway domain expanded, other countries were taken in as well. It was in Wales that the great bulk of rails was produced, and there was a time when America was solely dependent upon us, for not even a solitary rail was made in that great continent. William Crawshay did with America and its need for rails as he had done with Turkey and its requirement for merchant iron. He took scrip to an enormous extent, thus aiding the Americans financially in starting their extensive lines; and it has often been privately whispered that some scrip and not a few bonds were never realised in the ironmaster’s time. It may have been Isabel’s delicate constitution that made William decide she and his children needed country air and larger grounds than Gwaelodygarth, for in 1817 he rented Hensol Castle from the executors of his recently deceased uncle, Benjamin Hall. It was twenty miles from Merthyr and here Isabel and the younger children used to stay for most of the summer, William driving there for weekends. He seems to have looked upon the estate as an investment, for he actually bought it in 1826 for £17,500. 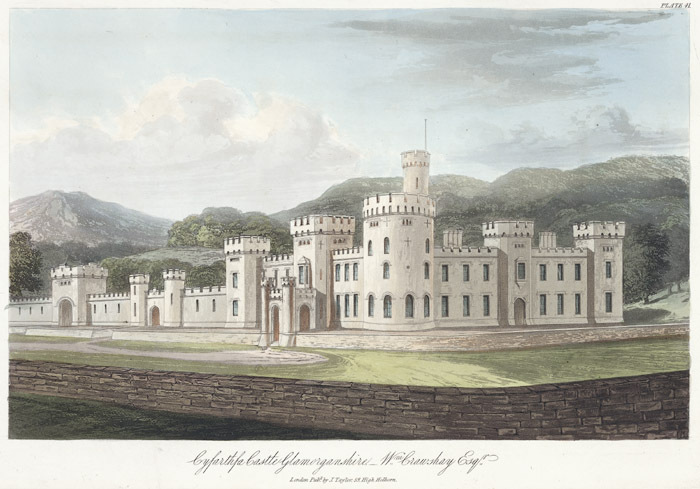 This was only a year after he had moved from Gwaelodygarth to Cyfarthfa Castle, and incurred heavy expenses in furnishing the latter, so to purchase Hensol Castle, money had to be borrowed. He tried to do so from a money-lender. William I heard about this, was furious, and after several angry letters to Merthyr Tydfil, he came to the rescue as he had done in the case of Rowfant. Unlike his father, William I; he favoured the investment of money in land, a matter over which the two were always at loggerheads. Hensol Castle seems to have been such a venture, and in middle age William II, purchased a huge estate, Caversham Park outside Reading. Father and son were keen horticulturists, enjoying the planning of their gardens and the growing of fruit in their hot-houses. When William III left school he went into Cyfarthfa ironworks, where William II found him increasingly useful, and came to rely on him as a deputy. Isabella spent the summer of 1833 at Hensol with the younger children, and William II spent Sundays and Mondays there too, leaving his eldest son in charge of business affairs. William II tried to persuade his father to buy Blaenavon, and then have his son William III to manage it, but the deal fell through. 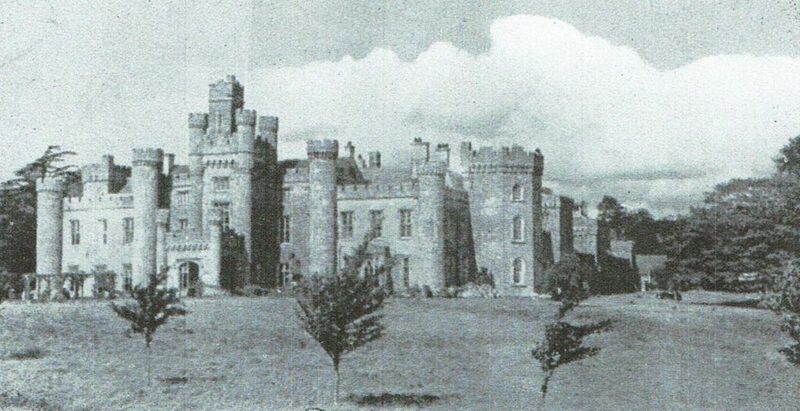 In the early part of 1838, William Crawshay at last sold Hensol Castle, which had become a burden to him in every way, especially now he had to attend to so much London business, and spent very little time in Wales. This was four years after the death of his father, who had often urged him to sell, telling him, “one such Place is enough for these times and with your family too.” In the same year he eventually bought Caversham Park. William Crawshay did not want two castles, and Isabel was better, and there was now a beautiful private park, woods and gardens in which his children could play, but as he asked nearly double the price he had originally paid, a buyer was hard to find. Lord Talbot offered £28,000 which William scorned. He considered he had so improved the property that it ought to fetch more. Even Cyfarthfa was waning. In any case he intended this as a home for his eldest son and that son’s family, but so far William III had not shown any interest in getting married, although he was nearly thirty. He would have to choose a wife, and the fortunate girl would become the new mistress of the castle. By the 1830’s, the Iron King was living in his father’s old London house, but did not think it good enough. Caversham Park was cheap, and occupied a fine position. Work had started in 1836 on the Great Western Railway from Paddington to Bristol, so Caversham was on a direct and fast route from London to Wales. The leasehold to Caversham Park was bought in 1838, the freehold in 1844. Disaster followed when, in 1850, the house was burnt to the ground, leaving only the columns to each side of the main house remaining. One story about William II is that he had not insured the house, but was so wealthy it did not matter. He rebuilt and improved it. A west wing was added to give better servants’ accommodation, a winter garden was built, and the house was put up around an iron frame; one of the first houses in England to be built that way. This was typical of the man and in the spirit of the time. The Great Exhibition had started in the iron-framed Crystal Palace in Hyde Park in 1851. It was a symbol of modernity. William was an iron founder. So with the architect Horace Jones, then in the early years of his career, but who would later be responsible for many important London buildings, such as Tower Bridge, William II set about creating a new building on the site of the old with a classical exterior, a modern structure and modern facilities. Another story told is that the Iron King was not on good terms with his wife (his third), and had the house designed so that they did not have to meet. The story may originate from a design feature. Separate staircases were provided for the male and female servants to reach their respective quarters without confusion. William II was a lover of show in both houses and parks. Cyfarthfa was a mock castle, complete with crenulations. Caversham was even more splendid. At both sites, much was spent on the gardens; in Wales on growing pineapples, in Caversham on colourful flowerbeds and a fernery. 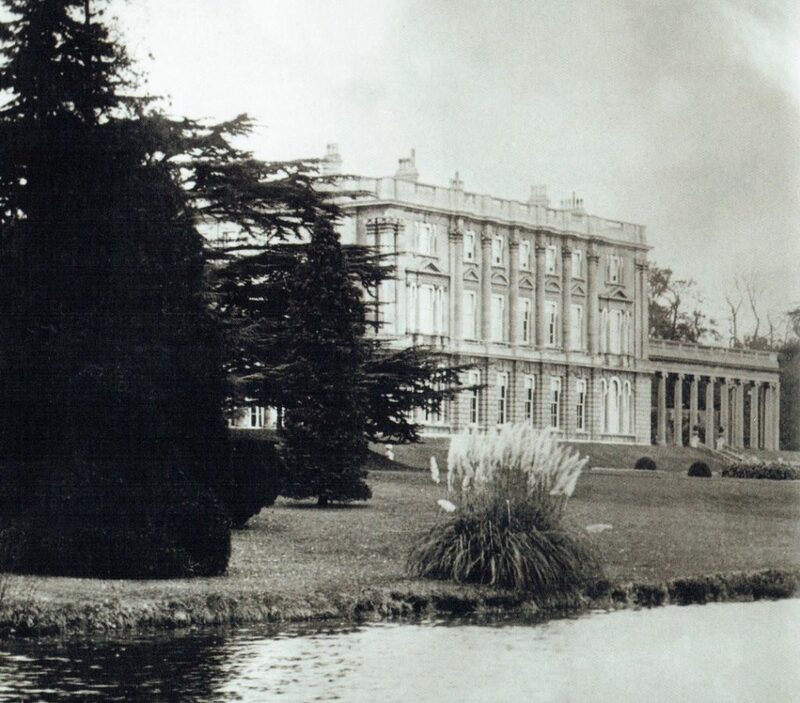 Fifteen gardeners were employed at Caversham alone. There was a considerable alarm in London about these disturbances in Merthyr Tydfil, and even King William IV himself read the daily reports dispatched by the officer in charge at Penydarren Place. William Crawshay I was very worried and as anxious as anyone for the restoration of law and order, which came after six days, when two men regarded as the chief ringleaders were captured. After the riot everything was normal on the surface, but bitter resentment was felt by the local workmen against the ironmasters and particularly William Crawshay II. This resentment increased further when one of the so called ringleaders, Richard Lewis, who was commonly known as Dic Penderyn, was sentenced to death at the Cardiff Assizes. The same sentence passed upon the other man, Lewis Lewis, nicknamed Lewsyn yr Heliwr, did not arouse such passions, but it was never carried out, being changed to transportation for life. Lewsyn was nearly forty and employed in carting coal from pits in the next valley to limekilns at Penderyn, near Hirwaun ironworks. There was no doubt about him being chief instigator in the attack of Coffin’s house, and shouting, “Bara neu waed” (bread or blood), which set off the struggle between the crowd and soldiers, but how he escaped the death penalty has always been a mystery. The generally accepted explanation is that he was the illegitimate son of a huntsman employed on the Bodwigiad estate, and this man persuaded his wealthy master to intercede on Lewsyn’s behalf. Much of the blame for Dic Penderyn’s end was laid, quite unjustly, on William Crawshay II. He supposed Dic to have been responsible for the affray outside the Castle Inn, and took soldiers to arrest him when the hiding place was discovered, but apart from this, William had no further part in Dic’s fate, neither was he responsible for the Home Secretary’s rejection of Price’s petition. William had a sense of justice that would never have allowed him to hound an innocent man, but he accepted the evidence of the Merthyr shopkeepers concerning Dic’s guilt, and considered he had done the right thing in handing over this criminal to the military. The press attacked William soon after the riots had ended, although their hostile criticisms had nothing to do with Dic Penderyn, who was still awaiting trial in Cardiff jail. The ironmaster was charged with vacillation and inconsistency in his dealings with workmen before the crisis. In 1845-6 Cyfarthfa had eleven furnaces in blast, with a yielding capacity of 80 tons, and a total yield in the year of 45,760 tons, which in time was to be doubled. He was associated with Mushet, the great authority on iron, and a keen analyst of coal. Together, the two men brought out a patent for making iron from copper slag, though the process does not appear to have been successful. It was remarked at the time that in all probability the failure was a fortunate one, as William Crawshay put all his energies after that into rail-making, and allowed his tendency to speculative inventions to sleep. Orders poured in to Cyfarthfa; its rails, like its bars, had fame, and the great district expanded, and workmen revelled in a luxury of which beforehand they had no conception. An idea of the wages earned was given years ago by an old man, an inmate of the workhouse, who, in 1830, earned £30 a month. He was assisted by two boys, and regularly that sum of £30 was brought into the house! That it was not economically used is shown by the fact that the workman drifted into the “Union.” He was a type of the mass of men of the time: A few saved money and acquired a little property, but the great multitude worked hard, lived freely, and died early, leaving no memento of their industry, other than poor fading testimonials to their lives in obscure chapels and churchyards. There is little known about the marriage of Elizabeth Homfray. All I know about it is that after her death he funded the family because they were spendthrifts. Even Richard Crawshay II had married a Homfray sister too. All the financial burden fell upon William, who in his will, left them life annuities. Isabel Thompson was the daughter of James Thompson of Grayrigg in Westmorland. She had two uncles who came to South Wales in connection with the iron boom. Isabel Thompson was a delicate woman with a tendency to tuberculosis, heightened by constant childbearing. She gave birth to two sons and seven daughters in the space of eleven years. Infant mortality was very high then, and it appears to have been a regular custom to call a later child by the same Christian name as one who had died. Isabel had a daughter named after herself, but who died the same year as her birth in 1816. Then came a son, Robert Thompson, followed by a second Isabel, Agnes, Amelia, Jessy, and Annette. The last child only lived for thirteen months, so when the twins were born in 1826, the girl was called Annette and the boy James. William II was thrilled with his large family. He had five children by his first wife, but one of the twin boys died in infancy. It may have been Isabel’s delicate constitution that made William decide she and his children needed country air and larger grounds than Gwaelodygarth, for in 1817 he rented Hensol Castle from the executors of his recently deceased uncle, Benjamin Hall. It was twenty miles from Merthyr and here Isabel and the younger children used to stay for most of the summer, William driving there for weekends. He seems to have looked upon the estate as an investment, for he actually bought it in 1826 for £17,500. 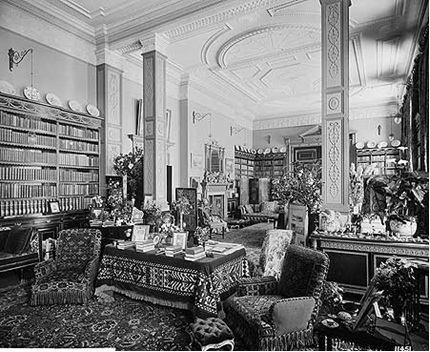 This was only a year after he had moved from Gwaelodygarth to Cyfarthfa Castle, and incurred heavy expenses in furnishing the latter. So in order to buy Hensol Castle, money had to be borrowed. He tried to do so from a money-lender. When William I heard about this, he was furious, but after several angry letters to Merthyr Tydfil, he came to the rescue as he had done in the case of Rowfant. There was a plaque to Isabel Crawshay at Llandaff, which was destroyed in World II, and another plaque at St John the Evangelist Church, Grayrigg, where the Thompson’s family grave is. Isabella Johnson was the daughter of the owner of Rhymney ironworks. They met at the beginning of 1828, nine months after the death of his second wife Isabela. In the Crawshay collection of letters is one that Isabella wrote to William II when she was forced to remain at Cyfarthfa Castle to look after one sick child, while he had rushed to Llandaff where Isabel’s younger son, James had been taken seriously ill at school. “Your letter of this evening my dearest William has indeed distressed me. I fondly hoped from the matter of your last night’s letter that our dear little boy was better and would continue so. Poor dear little fellow, how miserable I feel about him. I can only pray for his recovery. I would start tomorrow if I dared do so but after what you say I shall not. Agnes is better today, and all else well. 1830 was a time when newspapers were only in their infancy, and the sources of valuable information such as we now get from “newspaper files ” were but poor and scanty rills. The chroniclers of those days were principally magazines, and from one of these I am fortunate in getting an insight into the condition of Cyfarthfa Works at that time. In the “Mechanics’ Magazine,” of 1830, there was published a detailed account of Cyfarthfa, from the pen of a tourist who came into the valley, wondered greatly at what he saw, and took copious notes, which he published. The number of persons employed was 5,000, so by a moderate computation Mr. Crawshay supported 20,000 souls. The annual sum he expended for labour was £300,000. The number of horses employed was 450, the number of steam engines 8, doing the work of 12,000 horses; of water wheels 8, equal to the power of 654 horses ; furnaces of all kinds, 84; 3 forges, I foundry, 8 rolling mills, 1 boring mill. There were annually used 90,000 tons of iron stone, 40,000 tons of lime, 20,000 tons of coal, 80,000lb of gunpowder, and 120,000lb of candles. The next item is a startling one, showing the ramifications of the mine works underground and the network in the vicinity of the works, one hundred and twenty miles of tramways, a canal of several miles, with aqueducts, bridges, &c.
These sentiments are well worthy of being re-produced, and in many respects are as forcible of application now as they were then. The working men in the good times of the railway age had abundance of money, and a good deal of it was squandered. Not a solitary instance is extant of any institution having been started by themselves, and the great employers of labour in those primitive times thought that, in providing a comfortable means of livelihood for their people, they had done their part. It has been said that Richard Crawshay was free with his guineas to his men, much more so than William, but William was occasionally munificent. When hunger appealed to the world against the tyranny of its oppressors, he voluntarily gave £500, and other struggling nations came in for his support, for he hated injustice, and the tyranny of one man, or one nation, against another; and here it may be mentioned, though not in chronological order, that when the second Gethin explosion occurred few men grieved more deeply than he, and he took the care of the widows and orphans into his own hands, and would not allow any outside aid. I have stated that no record is extant of the working men having by co-operation left behind them any institution. But it must not be thought that all the workmen were simply those who lived to eat, drink, and sleep. Cyfarthfa in its early days had some men of an especially high class. Many were of a thoughtful cast of mind, and between them started a “Philosophic Association,” which was highly scientific as well as philosophic. They had expensive telescopes, microscopes, and globes, held periodical meetings, and discussed subjects of the most profound character. It has been said that they were a little tinged with the doubts of Thomas Paine, and not a little moved by the French Revolution, but it was not from their body that the great Riots had sprung, which I shall next bring under notice. 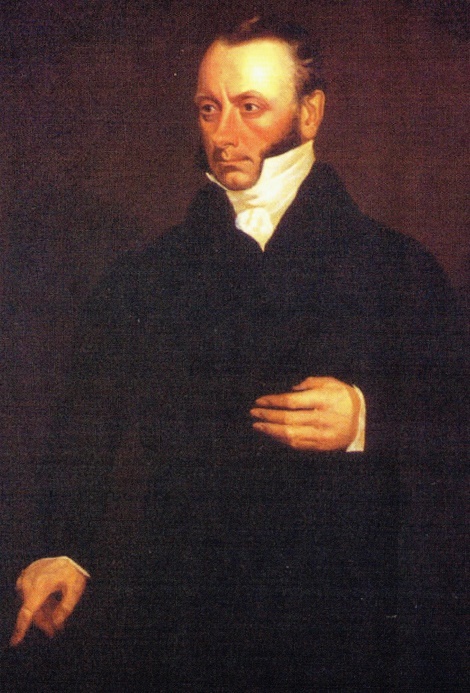 Mr. William Crawshay retained to the last the government of Cyfarthfa Works and Hirwaun, which was sub-managed by his son Henry, who then afterwards left for the Forest of Dean, whilst Treforest was run by Francis, who then ran Hirwaun Ironworks. Sir, In your paper of the 7th instant, you have paid me a compliment which I cannot but acknowledge as publicly as you have made it, and I thus do so direct to yourself, in the expectation that this my letter will also appear in your paper. I thank you sincerely for your flattering expressions as to myself, and could have wished, that through a long life, I had merited all you say of me, more particularly in the one point, “Never hasty in decision.” I have, however, no cause myself to complain of the result of a rather hasty temperament, for I have been blessed, as a manufacturer and tradesman, with unusual and ample success, and I hope that no man has at any time been injured by my quick determinations. Lancashire, and the East Coast, where iron ore, newly discovered, is used, to contend even with which I am obliged to convey the same ore to my works, at a cost much aggravated by long carriage, and mineral profit (of course) to those who raise it, and this to a greater extent than two-thirds of all I use in my furnaces at Cyfarthfa! But I feel. Sir, that I am digressing from my intended simple acknowledgment of your article, so complimentary to me, and I will only further allude to one other disadvantage under which I am compelled to labour at Cyfarthfa, though I will never, by availing myself of similar injustice to my workmen, take that advantage which is enjoyed by many of my brother competitors in the manufacture of iron, over me, “The Truck System!” I wholly and utterly disapprove of it, and will, while I live, pay my men for hard work in hard money, and money only; and I feel that I should be justified in joining any league to put an end to a system which I have no doubt gives to those who practice it a clear advantage over me of 10 per cent., or 2s in the pound, upon all amounts incurred for labour, and which Truck System, although attempted and intended to be suppressed by the legislature, is openly and notoriously carried on, under masked declarations and provisions, to the contrary. Of Mr. William Crawshay, just deceased, there are many little anecdotes told which testify to his kindness of heart. One of these has been related to us. At the time when the “Railway King,” George Hudson, reigned triumphant, and the commercial world was plunging into a vortex of speculation, Mr. Crawshay was allotted a large quantity of stock in concerns in which Mr. Hudson was interested. A gentleman, well known to us, called on the great ironmaster one day, who showed him the scrip of these speculations, observing, “There, I could get £40,000 in the market for these tomorrow.” then why don’t you sell them, sir?” was the inquiry. “No, no,” said Mr. Crawshay, “you don’t know what a man that Hudson is.” The forty thousand pounds was never realised, for the crash soon came, and amongst the sufferers was an old domestic servant of Mr. Crawshay’s, who, tempted by the success of others, had invested his entire savings, amounting to between £400 and £500. “Well,” said his master, on hearing of his servant’s disaster, “a pretty fool you have made of yourself, lost all your money, I hear, in these d-d railways.” “Yes, sir,” was the sad response; too true, sir, too true. “Why, how could you have been such a fool, man?” asked Mr. Crawshay. The servant could only reply that he had heard his master had a large sum in Mr. Hudson’s railways, and he thought he could not go far wrong if he followed in his master’s steps. “Humph,” said Mr. Crawshay, “I thought as much, there’s something in that, you shan’t lose, I’ll pay the money;” and he gave a cheque for the entire sum. Like his father and grandfather, William II had no desire to be other than plain mister, or esquire, and though he was offered a title in 1859, the same year as his cousin was created Lord Llanover, he declined to accept it. The past week has been pregnant with many events of import, but the leading feature of the latest “intelligence” is the death of William Crawshay, one of the most notable men in wide England. Our own personal experience of this remarkable and gifted man would occupy 50 columns, even were we to condense into the smallest limits the leading incidents of his remarkable and eventful life. We have no space to trace his genealogy, and we have not sufficient accredited information to pretend to write a reliable obituary; but when it is announced to the busy world and the industrial community of Europe that William Crawshay, the great ironmaster of Cambria or South Wales, has “departed this life,” and that he has over him the stereotyped “Hic Jacet,” thousands of quiet and respectable people will enquire for five minutes into the eventful life of this famous and remarkable patriarch, who has for the last half century been one of the most remarkable men of the times. When we refer to William Crawshay of Merthyr Tydfil we allude to a man who has done more for Glamorganshire, and perhaps for South Wales, than any other living individual. He was one of the few remarkable men who can give a character to a country and a tone to an age. In the extent of his speculations and unbounded enterprise, we cannot name another Cambrian who has done so much and so well for the Principality of Wales. The name of William Crawshay is historical The conservative and exclusive Brahmin of India, the pig-tailed Mandarin of China, the scalp-locked aborigines of half the barbaric states in the world, are familiar with the name and fame of this renowned gentleman. It was not for him to boast of conquered countries and principalities, or of thousands of slaughtered and mutilated members of the human family. It was his proud and distinguished lot to be in the van of peaceful industry and labour. We may state that although in his declining years, in accordance with ordinary physical laws, he retired from active participation in the world’s iron market, still his pupils and disciples have inaugurated a school of art and science that is destined for untold ages to maintained supremacy. We will not arrogate to ourselves the pretension of being Mr. Crawshay’s historians; we firmly believe that he will occupy a prominent position in the page historic. When the present generation has been gathered to their fathers, when Cardiff, Merthyr, and Swansea will, as it must inevitably be the case, be tenfold their present population, William Crawshay, of Merthyr Tydfil, the great ironmaster, will be a familiar household word to every educated man and woman, not only in Wales, but in the whole civilized kingdom. While the funeral of Mr. Crawshay was taking place in the neighbourhood of London, in one of those quiet and little known cemeteries that seem by their isolation to be peculiarly fitted for the dead, a little less mournful, and far more imposing ceremony took place in the scene of his earnest and successful labours. In this order they marched to Cyfarthfa, and after the service returned in the same manner through Nantygwenith Street to the office, occupying a long extent, for the numbers were considerable, and as all were well-dressed the procession looked peculiarly imposing. To a stranger who may have thought Mr. Crawshay a hard taskmaster, and the men and women of an inferior grade, the procession, while dispelling a common error, must have looked most striking, for not a man or a woman but was dressed respectably, and all looked as if the condition of things at Cyfarthfa was most flourishing. We know, unfortunately, that the condition of the iron trade has not been satisfactory, and hence all the more honour to our working men and working women who, out of respect to their own master, came out in so creditable a manner. We are informed that by the terms of the will Mr. Robert Crawshay receives all the property in South Wales, including Cyfarthfa Castle, while the works in the Forest of Dean are willed to Mr. Henry Crawshay. The other sons have annuities. Mrs. William Crawshay retains Caversham, and an annuity for life. At her death the estate goes to Miss Baby Crawshay, and at her death to Mr. William Crawshay Jun. The property in South Wales is estimated at near two millions sterling. By the provisions of the will, interment was to take place four clear days after death, in a common earth grave, and the men on the estate, 90 in number, were to attend and receive a pint of good ale, eatables, and gloves and hatbands. The will of William Crawshay of Caversham Park, Oxon, was proved on the 23rd July by the executors, Robert Thompson Crawshay and Henry Crawshay, his sons, and William Gray, of 5, Tokenhouse Yard, London. The personality was sworn under £2,000.000 sterling. The will bears date October 21, 1865, and the testator died at his seat, Caversham Park, on the 4th July, in his 80th year. He bequeaths to his widow all the stock, furniture, and effects at Caversham absolutely; also his mansion, estates, and farms in the county of Oxford, together with an annuity of £2,000 per annum. After her decease the mansion, &c., pass to his daughter, Sarah Louise Crawshay, for her life; and ultimately to his grandson, William, the son of Robert T. Crawshay. To his daughter Eliza, widow of the Rev George Thomas (in addition to a former provision), he bequeaths an annuity of £1,000 per annum to each of his daughters, Amelia widow of Capt. T. F. Sandeman and Jessy, widow of Alfred Crawshay (in addition to sums previously secured), £150,000 Consoles, and £10,000 additional to each under the powers of a settlement; to his daughter Sarah Louise Crawshay, £60.000 Consoles: all these amounts being settled on his daughters for life, with remainder to their Children. To the four children of his deceased daughter Agnes Dolphin he bequeaths the sum of £20,000 each. To his daughter Annette (wife of Captain Parland) an annuity of £1,500 per annum while living in England, and, if she leaves children surviving her, he bequeaths to each £20.000; and he further appoints to his daughter Annette £7.000 under the settlement before referred to. To his grandson William Crawshay Ralston he bequeaths £10,000, which had been provided for the testator’s deceased daughter Isabel Ralston, and the further sum of £30,000. After reciting that he had already amply provided for his sons Francis and Henry, the testator directs his executors to set apart £160,000 consoles upon trust, to pay the dividend to his son Francis during his life, and, upon his decease, to hold £40,000 part thereof—viz., one moiety of £20,000 for the sole use of Isabella Fothergill and the other for Laura Fothergill, daughters of his said son Francis, with remainder to their respective children, and as to the remainder of the said £160,000, for the other children of his said son Francis. To his son Henry the testator gives all the Syracuse and Binghamton Railroad bonds and shares which he possessed; also £150,000 Turkish Stock, and £80,000 secured by his bonds. There are legacies to his executor, W. Gray, and to several of his servants, clerks. &c.; and the testator devised his Castle of Cyfarthfa (Glamorganshire), and the lands and ironworks there, and all the residue of his moneys, securities, and property, to his son Robert Thompson Crawshay. The History of the Iron, Steel, Tinplate and other Trades of Wales, by Charles Wilkins 1903.